If you want to visit a remarkable place full of mysteries, take a trip to New Mexico’s Chaco Canyon. I suggest that you take some time to read up on it before you go, so you can better understand and appreciate all it represents. 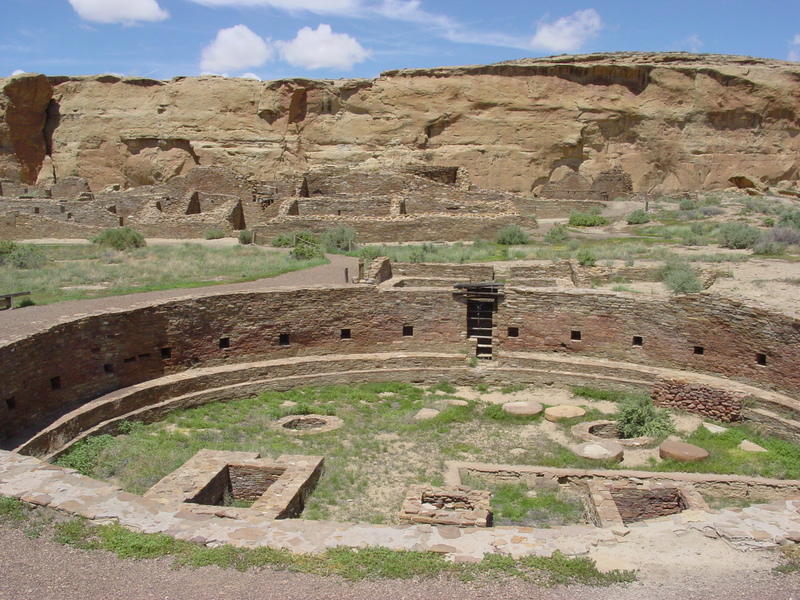 “From AD 850 to 1250, Chaco was a hub of ceremony, trade, and administration for the prehistoric Four Corners area–unlike anything before or since. Chaco is remarkable for its multi-storied public buildings, ceremonial buildings, and distinctive architecture. These structures required considerable planning, designing, organizing of labor, and engineering to construct. The Chacoan people combined many elements: pre-planned architectural designs, astronomical alignments, geometry, landscaping, and engineering to create an ancient urban center of spectacular public architecture–one that still awes and inspires us a thousand years later.” (The Center of a Culture. http://www.nps.gov/chcu/home.htm). PBS just aired an very good documentary, narrated by Robert Redford, about the mysteries of Chaco Canyon. It examines both the science and culture of the ancient indian people in the southwest. Click here to link to a study guide for teachers which will enable you to skim the key points of the film. If you like to read fiction, then I suggest that you read Tony Hillerman’s book, A Thief of Time. His description of Chaco Canyon is perfect. If you like that book and want to read more, Chaco Canyon is also a part of Hillerman’s books, Coyote Waits, and Sacred Clowns. PBS Chaco Canyon Documentary Aired Wednesday, June 15, 2011 at 9:00 p.m. ET/PT. Narrated by Robert Redford. If you have visited Chaco Canyon, let me know what you thought of it.